Developer Advisor, Chris Jones, left. Developer Intern, Athif Wulandana, right. Here’s how it works. Each intern is assigned a single Advisor for the summer; each Advisor is a full-time staff member and specialist in the intern’s chosen field. The Advisor serves as a teacher, committed to transmitting her knowledge and expertise to the intern, usually developing a professional relationship with the intern along the way. In most cases, our Advisors become the intern’s first significant professional contact in our industry. I try to select Advisors as early as possible in the recruiting process so they can interview prospective interns. Ideally, the interview process lets upcoming Advisors develop an early sense of an intern’s strengths, weaknesses, and interests. At least a few weeks in advance of the internship, I ask Advisors to chat with their incoming interns about goals for the summer. Fresh out of these conversations, each Advisor sketches out a ten-week curriculum for the intern to follow during their time at Viget, and then works with the intern during Week One to tweak and finalize that curriculum. During the summer months, the Advisor provides critical teaching and guidance to help the intern achieve her summer learning goals. 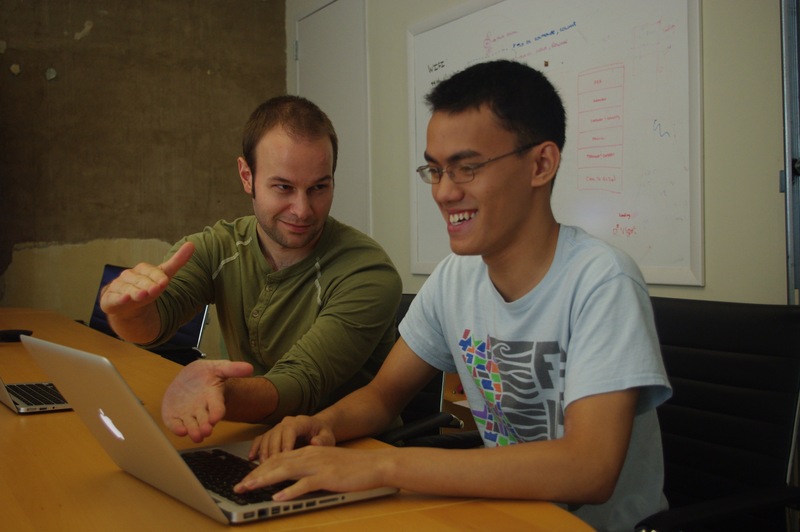 The Advisor helps the intern develop and launch projects, points the intern to valuable resources, reviews the intern’s progress, and shares knowledge critical to the field. Often, the Advisor invites the intern to internal and client meetings and asks the intern to shadow during various work sessions. Often, the Advisor might hit “pause” on her own work day to talk through a specific challenge or topic with the intern. At the end of the internship, the Advisor compiles feedback from others, adds it to his own, and produces a written Final Review, shared over lunch during the last week of the program. Oftentimes (and ideally) the Advisor also becomes a friend. 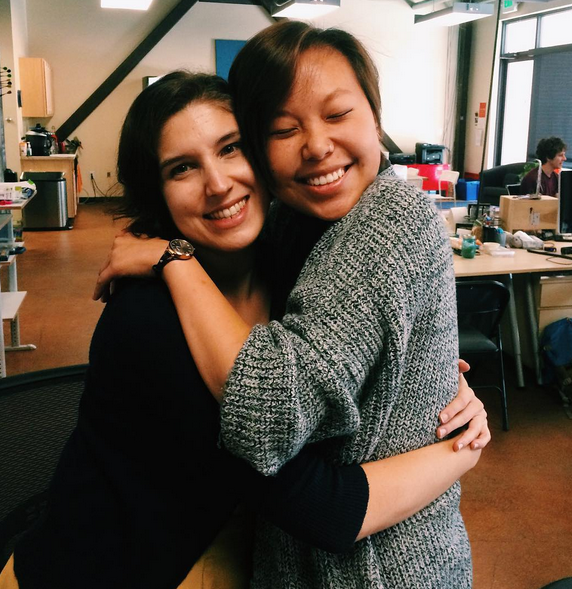 Design Advisor, Blair Culbreth (left), and Design Intern, Lillian Liu (right), share a parting hug on the last day of the internship. But it’s worth noting that, at Viget, Advisors haven’t always been called Advisors. During our first iteration of the summer program, in 2012, we used the title that most programs use: “mentor.” And, while that title was fine, we found that it came with the subtle implication that others among our staff couldn’t or shouldn’t serve as mentors in some capacity. In other words, since a few individuals were identified officially as ”mentors,” other staff tended to assume that “mentorship” was fully taken care of, and they tended to be passive about offering less formal mentorship along the way. (b) align the newly-dubbed “Advisor” role more closely with that of a typical academic Advisor in a college setting. The title would be a familiar one to most students and help them appreciate the fundamentally academic nature of our program. We’ve found that, over the years, more and more individuals seize opportunities throughout the summer to offer informal mentorship, without worrying about stepping on the toes of an official “mentor.” Such mentorship takes on different forms: a Designer introducing a Dev Intern to basic design concepts; a UX Designer offering a micro-class for interns on how to present work to clients. Such moments aren’t planned in advance as part of the program’s structure, but—partly because they arise more organically as a function of the various personalities at play during a given summer—they hugely enrich the overall internship experience. Titles are tricky; they often seem beside the point, and yet they can impact how people understand and perform their roles. In this instance, changing a title has helped us define the vision for our program. Each summer, we’re committed to supporting Advisors as they help transform students into early-career professionals. And we also welcome any of our staff to pitch in anytime as unofficial—and much-appreciated—mentors.